Cobalt Ultra is a self adhered roof underlayment designed for sloped roof applications to help protect against water infiltration from ice dams and wind driven rain. Cobalt Ultra is designed for use under asphalt shingles, concrete and clay tiles, shakes, synthetic shingles, primed cedar shakes, and all types of metal roofing including high temperature applications such as copper, zinc, and Cor-Ten® roofing panels located in high altitude and southern regions. the deck area must be removed and there should not be any voids, damaged or unsupported areas. 2. 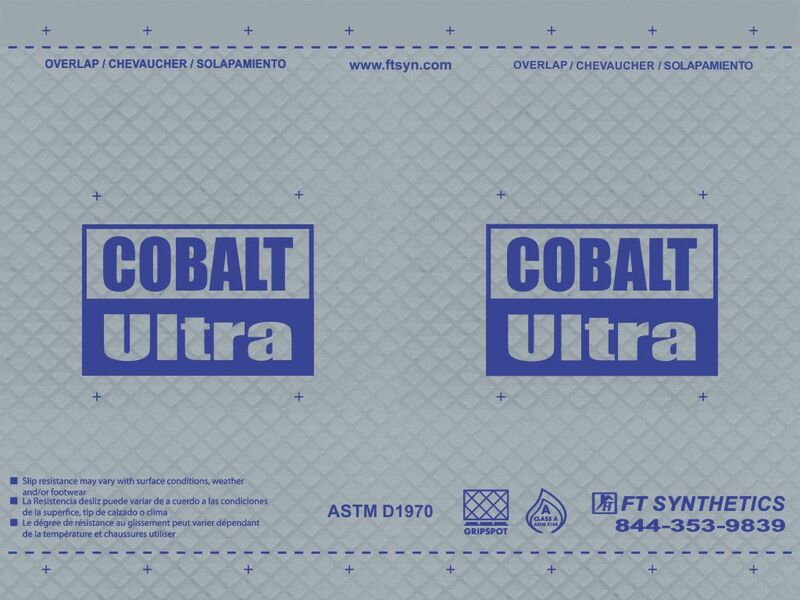 Cobalt Ultra may be applied directly to a plywood, OSB, fully cured concrete or masonry roof surface. Priming is not required for attaching to dry wood or metal surfaces when the temperature is above -4°F (-20°C). Concrete and masonry decks should be primed with a solvent or a water based primer that meets ASTM D41 for asphalt based self-adhesive membranes. 3. For re-roofing projects replace any water damaged sheathing and sweep roof deck thoroughly removing dust, dirt and loose nails. Do not install over old roof covering. 4. Proper roof ventilation and insulation is required to help reduce ice dams and to minimize condensation. Cobalt Ultra is a vapor barrier. 1. Cobalt Ultra should be installed on a continuous structural deck and it is recommended for use in sloped roof applications 2:12 and above. For steep slope applications (6:12 or greater) or when installing at temperatures greater than 100°F (38°C) it is recommended to blind nail the overlap area using the “+” marks as provided. 2. Cobalt Ultra is to be laid out horizontally (parallel) to the eave with the printed side up. Install using 3″ side laps and 6″ end laps. Always work from the low point to the high point of the roof. Apply the membrane in valleys before the membrane is applied to the eaves. Cut product into manageable lengths 10-15ft (3-5m) and position parallel to the edge of the roof. Peel back one side of the split release sheet approximately 4” (10 cm), position and then apply to the roof deck. Then remove completely one side of the split release sheet and hand press into place before peeling back the remaining half of the split release liner and again press down on the product. 3. For best performance and to improve adhesion it is recommended to smooth and secure the membrane with a 40 lb or heavier pressure roller. If a roller is not available or considered safe, recommendation is to walk on all laps, and as much of the field area as possible to push the adhesive into the surface pores of the roof deck and overlaps. 4. If Cobalt Ultra is to be applied over the drip edge, ensure that it is subsequently covered by a metal drip edge, gutter, or other ﬂashing material. 5. For repairs or low slope installations where it is required to overlap the membrane onto the Gripspot walking surface such as on the end laps a primer can be used to increase adhesion. 6. For ice damming protection it is recommended that the membrane extend from the eave up the roof to a point 24” inside the exterior wall. This should be above the maximum ice dam buildup line in most areas. Consult your local building code for speciﬁc requirements. 7. Cobalt Ultra should be covered by a primary roofing material within 180 days. to -4°F (-20°C). For best results store product at room temperature until just before application. For cold weather applications below -4°F (-20°C) a primer should be used and the laps blind nailed. Blind nail with 3/8” head rooﬁng nails of 1” or longer in the 3” over lap area on the “+” marks as provided. As with any roofing product, always follow safety instructions, building codes and safe work practices issues by local government bodies (e.g. OSHA / WCB) and always use and wear fall protection devices when working on roofs. Release liners are slippery and should be removed from work area immediately after application. Use caution when walking on or standing on Cobalt Ultra as slip resistance may vary with surface conditions, weather, footwear and roof pitch.